Zeta Phi Beta Sorority, Inc. - Alpha Theta Zeta Chapter presented "Dining with the Newest Finer Women" induction services held April 10 at the Con-Ed Building. The 11 Pearlz of Nu Blu are: Jennifer Baker, Danitra Beadles, Yolanda Bright, Kristina Ferebee, Comia Flynn, Dorsenia Hendrix, LaShaun Lovett, Reina Mike, Lawanda Robinson, Hazel Waldon and Ansley Williams. 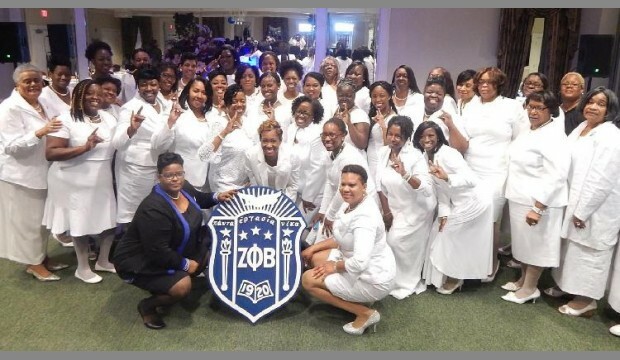 The national membership of Zeta Phi Beta Sorority Inc. includes more than 125,000 college-educated, dynamic, community services driven, diverse and professional women. The benefits of membership include opportunities for professional and personal development and sisterhood. Mary Breaux Wright serves as International President, Gina R. Smith, President, and P. Shaniqua Vasser, MIP coordinator.